PUTRAJAYA, 19 Jan 2014 – Minister in the Prime Minister’s Department Tan Sri Joseph Kurup has urged that all debates on sensitive issues that touch on racial and religious sentiments be stopped for the sake of national harmony.”The less we talk about sensitive issues, the better,” he said at a press conference after officiating the two day Strengthening Nationhood: Sharing Experiences (COSMA3) conference organised by The National University of Malaysia (UKM) here today. He said discussions on positive issues or detailed explanations on specific issues were more beneficial to the people. Earlier, in his speech at the conference, Kurup said several current issues had created ethnic and religious tensions, leading to restlessness among the people. “The issue on the usage of the word “Allah” by Christians also tested the ethnic bonds. I believe the clear message to the people is that they should correct their perception of the government’s efforts tomaintain harmony,” he said. The Appeals Court had ruled against allowing the use of the word “Allah” in the Catholic weekly magazine, Herald. The publisher had since taken the matter for appeal to the Federal court which would meet to make a decision on February 24. Kurup said all parties should respect the decision of the court and not do anything to cause provocation. In another development , he called on all public and private universities to encourage students to contribute positively to current issues so that youths would be less likely to demonstrate in the streets. He expressed dismay of youths taking part in protests while they can help ease public tensions by concentrating more on their studies. He also said a new Ethnic Relations Module for education which was introduced in institutions of higher learning should be started at the school level.It is better to start teaching children about ethnic relations as early as possible because not all students would eventually enter university, he said. 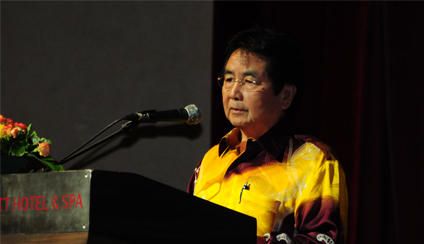 On the, Kurup said resolutions made at the COSMA3 conference would provide ideas to the government to prepare a national blueprint on unity.The annual conference, which is now in its third year, was organised by the Institute of Ethnic Studies (KITA) of UKM, together with the Ministry of Education, Universiti Putra Malaysia and Universiti Malaya. Also present were UKM Vice-Chancellor Prof Dato’ Dr Noor Azlan Ghazali and Director and founder of KITA, Distinguished Prof Datuk Dr Shamsul Amri Baharuddin.Some 40 scholars and academics took part to present their research papers at the conference.